Shailene Woodley was arrested yesterday for criminal trespassing in North Dakota for protesting the Dakota Access Pipeline, which is planned to be built on what’s considered sacred land for the Standing Rock Sioux Tribe. 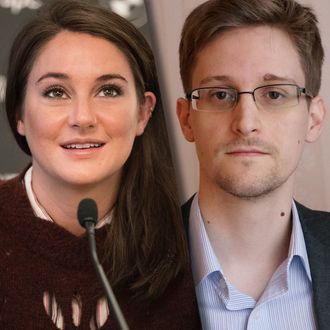 Now, a day after the events transpired, real-life whistleblower Edward Snowden has come to the defense of the actress, who recently played his girlfriend in the Joseph Gordon Levitt–starring movie about his life, Snowden. “So @ShaileneWoodley joined the #DAPL protest to defend clean water,” he tweeted this morning, linking to an Al Jazeera news post about her arrest. “It was peaceful, yet police showed up looking like this. Many arrests … Did the police single her out for livestreaming the protest? And why did they use armored vehicles and military gear to arrest an actress?” Woodley, who was one of 27 people arrested in a protest that included roughly 200 people, alleges she was singled out for her fame and because she livestreamed the event on Facebook. No word on whether the incredibly on-the-nose Divergent joke she delivered mid-arrest was enough to send her to jail.